We welcome members of reciprocal sailing or yacht clubs as visitors. Please read the following information carefully – especially if you have not visited us before. We are an all-volunteer, self-help club so we operate on the honour system. This means that you, as a visitor, are responsible for registering, paying fees and, in general, adhering to all our rules and regulations. Any abuse of this trust may result in the termination of all reciprocity with your Club. 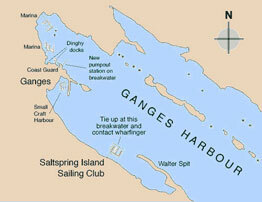 As you can see from this map, we are located about 1 mile SE of Ganges village in Ganges Harbour on Salt Spring Island. On arrival at our marina, you must first tie up on the outside of the breakwater, and then obtain help from the Volunteer Daily Wharfinger (or any other club member if no Wharfinger is on duty) in locating a suitable moorage spot. Visitors arriving after-hours may remain tied to the outside of the breakwater (see dock plan below) if no member is available to direct them to a vacant member slip. Please do not occupy a member slip unless you’ve been directed to do so. You must also at this time fly your club burgee and be ready to produce your current club membership card. Visitors must also produce written proof of a minimum of $2,000,000 liability insurance (note that this is new for 2019). Please note that our Club will be closed to reciprocal visitors during the Round Saltspring Race as listed below. 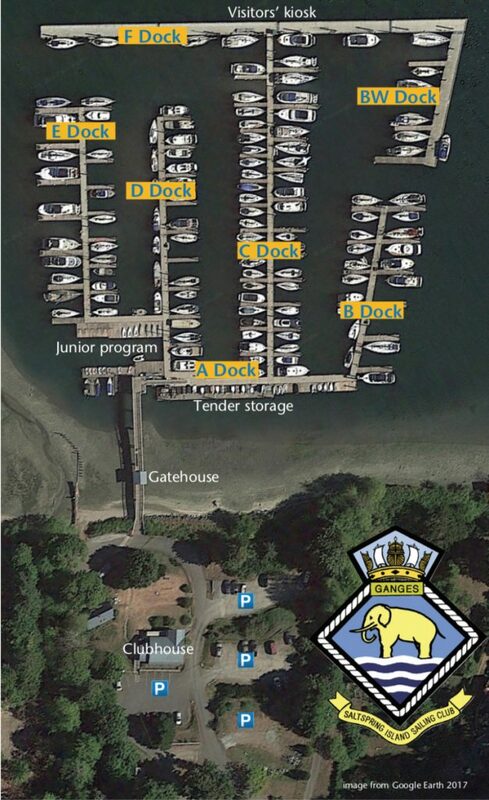 Moorage When you arrive at the Sailing Club, first tie up on the outside of the cement breakwater (“F” Dock or “BW” Dock, shown above), and contact the Volunteer Daily Wharfinger. We have approximately 315 feet marked as “Visitors Dock”. Also, members’ vacant moorage spots are regularly assigned to visitors. Reservations are not possible. Registration Immediately upon arrival, all visitors must register in the registration book at the registration station located on “F” Dock. The registration form must be completed, and the white copy of the form – plus the appropriate fees – are to be placed in an envelope and deposited in the locked cash box. The yellow copy of the registration form is to be posted in your boat’s window, dockside. Maximum Vessel Length 48 feet LOA (including all protrusions) is the maximum vessel size allowable. Payment Please deposit all payments in the lock box at the visitor’s registration station on “F” Dock. Time Limit We allow a maximum of fifteen (15) days per calendar year for reciprocal visitors. Boat Occupancy Visiting boats are not to be left unattended overnight. Security Gate and Facilities The gatehouse located on the pier and the washrooms/showers (accessed from the exterior lower level of the clubhouse) are controlled by keypads. The code to open these is posted at the visitor’s registration station on “F” Dock. Power Most slips and the breakwater docks have 30 amp service. Only CSA/UL certified power cords, rated for 30 amps or more and designed for marine application, may be used to connect to shore power, and must terminate on the boat at a marine power inlet fixture or suitable adapter in a dry location. Please pay $5.00 per day per plugged-in cord. Water Water is available on the docks, but washing down is not permitted. Washrooms and Showers Men’s and Women’s washrooms with showers are located on the lower level of the clubhouse, each with a separate entrance. Note: washrooms accommodate only one person at a time. We request that showers be kept short (within the 5 minute timer) and a $2.00 donation per shower should be deposited in the honour box located next to the shower. Fuel, Ice, Laundry and Groceries Supplies and basic marine equipment are available in nearby Ganges. The quickest access to the village is by dinghy, and there are several dinghy docks downtown for visitors’ use. The walk to Ganges village from the Club is approximately 1.5 km and includes hills both ways. Garbage We do not have any garbage facilities at our Club. You must take it home with you, or you can transport is to the Small Craft Harbour in Ganges where, for a small fee, it can be disposed of. Telephone A telephone for local or emergency calls is located at the head of the pier. Long-distance or toll calls are not possible. Phone numbers of grocery stores, taxis and pizza deliveries can be found on the bulletin board at the head of the pier. Internet Access WIFI is available on the docks. The signal is best closer to the Clubhouse. You can connect either to ShawOpen (free for Shaw Internet customers) or to the SISC network. The rate for the use of the SISC WIFI network is $2.00 per day. Fires No open fires or BBQs are allowed on the docks. Holding Tank No overboard discharge of any kind is allowed in our marina. You are strongly encouraged to use the pump- out facility at the breakwater/wharf by the Coast Guard Station in Ganges’ inner harbour if you must empty your holding tanks. Pets All pets must be on a leash at all times while on the docks or on Club grounds. Pets are not allowed in the clubhouse or washrooms. Owners are responsible for cleaning up after their pets. Closures The Sailing Club marina is closed to reciprocal visitors for our annual Round Saltspring Race on the Victoria Day weekend. In 2019, this will be May 16 to 21. As well, it will be closed to reciprocal visitors on July 7, 2019 for the Vendee SaltSpring Race, during the IOM event on June 21-23, 2019, and for the joint race with the Sidney Club on Sept. 28, 2019. Wharfinger The Volunteer Daily Wharfinger is available from 1300 to 1700 hours daily during the summer, from May 15th to September 15th. Before or after those hours or dates, please obtain help or information from any member on the docks, or phone the Wharfinger. The phone number is posted at the visitor’s registration station. Please note that moorage privileges are extended to visitors at their own risk. Saltspring Island Sailing Club shall not be liable for loss or damage while at Club facilities, including docks. outside of the cement breakwater (“F” Dock or “BW” Dock, shown above), and contact the Volunteer Daily Wharfinger. We have approximately 315 feet marked as “Visitors Dock”. Also, members’ vacant moorage spots are regularly assigned to visitors. Reservations are not possible. Vessel Length 48 feet LOA (including all protrusions) is the maximum vessel size allowable. and Facilities The gatehouse located on the pier and the washrooms/showers (accessed from the exterior lower level of the clubhouse) are controlled by keypads. The code to open these is posted at the visitor’s registration station on “F” Dock. and Showers Men’s and Women’s washrooms with showers are located on the lower level of the clubhouse, each with a separate entrance. Note: washrooms accommodate only one person at a time. We request that showers be kept short (within the 5 minute timer) and a $2.00 donation per shower should be deposited in the honour box located next to the shower. by dinghy, and there are several dinghy docks downtown for visitors’ use. The walk to Ganges village from the Club is approximately 1.5 km and includes hills both ways. small fee, it can be disposed of. bulletin board at the head of the pier. marina. You are strongly encouraged to use the pump- out facility at the breakwater/wharf by the Coast Guard Station in Ganges’ inner harbour if you must empty your holding tanks. for cleaning up after their pets.